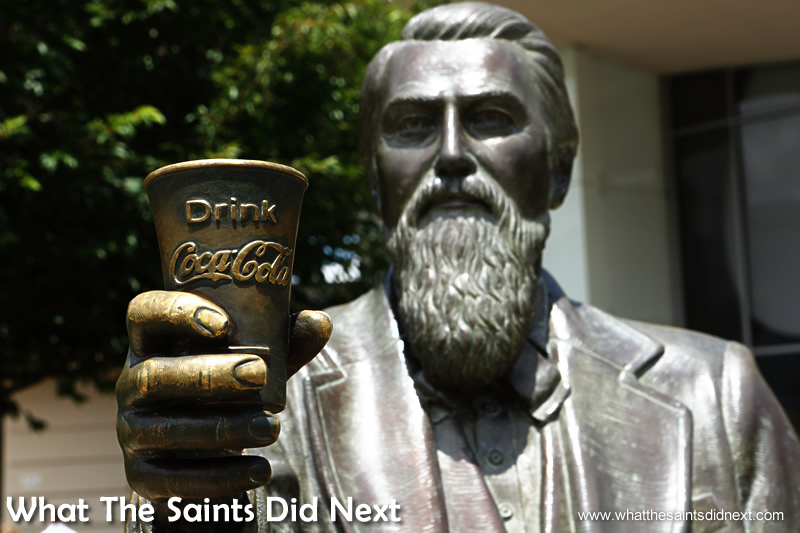 The John Pemberton bronze statue at the front of the World of Coca-Cola Museum Atlanta acknowledges the inventor of Coca-Cola. When you visit a place that’s likely to be a once in a lifetime call, there’s a certain obligation to experience what that place has to offer while you’re there; to try new things. 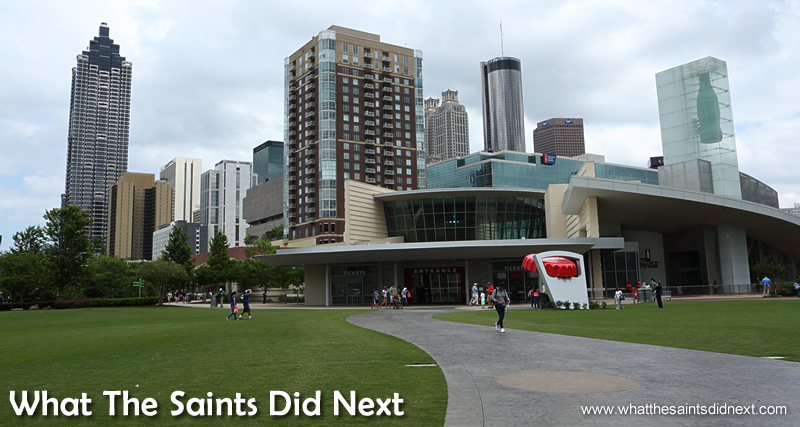 Our checklist for Atlanta, Georgia couldn’t ignore a visit to Pemberton Place, and the new, World of Coca-Cola. 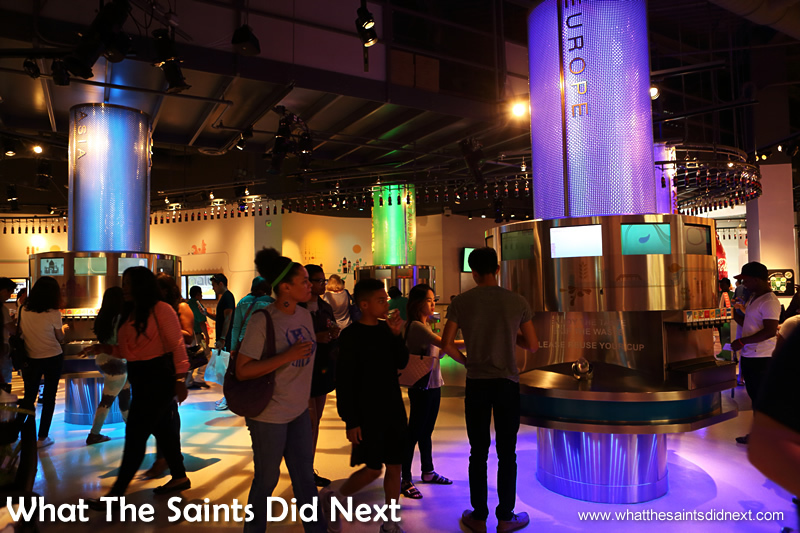 I can’t shake the feeling that World of Coca-Cola Museum Atlanta is actually a very clever marketing ploy – we’ve paid to get in to let them tell us how great their product is, then in turn be more inclined to go out and pay to consume the product. 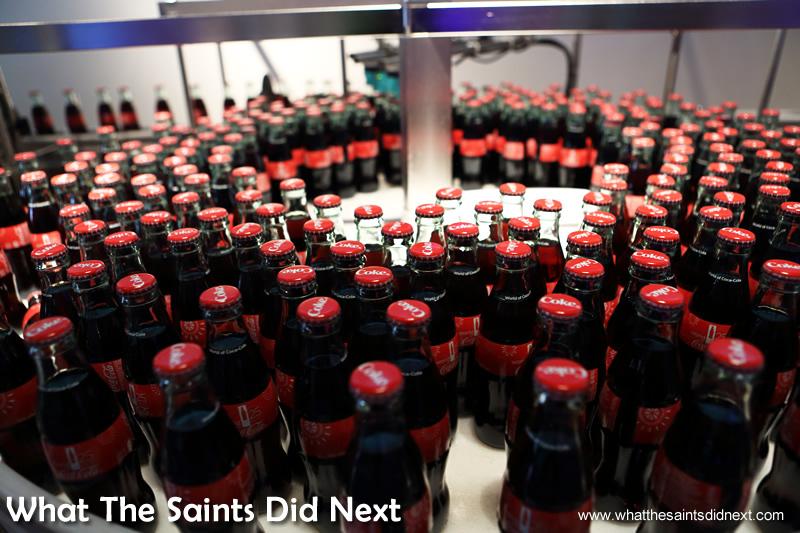 But then the marketing people at Coca-Cola are clearly some of the best in the business. 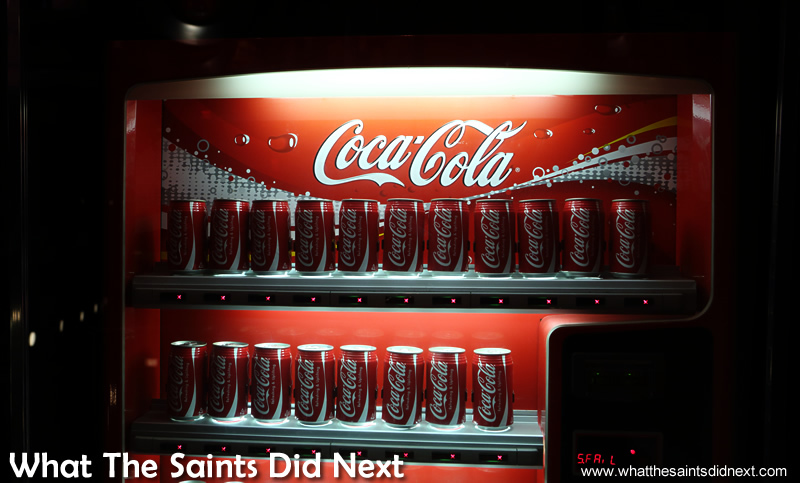 Forbes listed the soft drink as fourth most valuable brand in 2015, behind Apple (1st), Microsoft and Google. The World of Coca-Cola Museum Atlanta, set against the backdrop of the city skyline. General entry fee is $16 for adults. 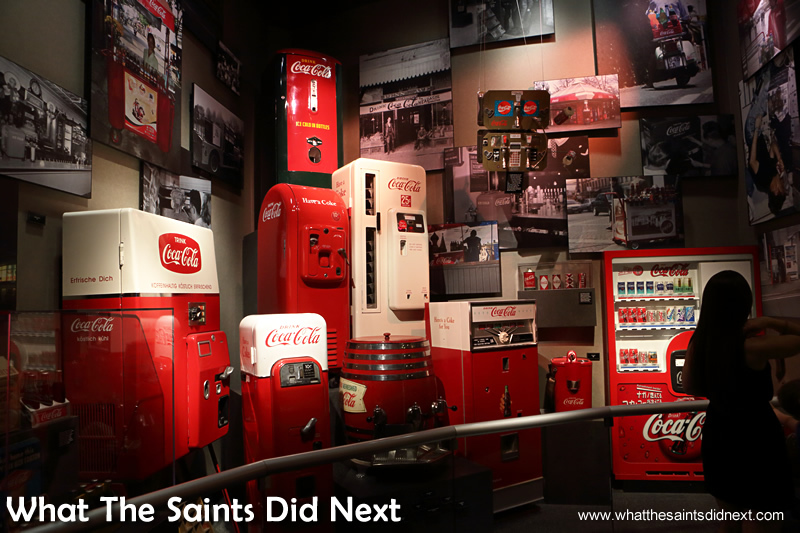 The World of Coca-Cola Museum Atlanta is part of a collection of attractions located within the Olympic Centennial Park area. The CNN Centre is nearby. More than five years ago both Sharon and I pretty much ceased drinking high sugar content soft drinks; it was an easy decision, the health benefits were a no brainer. But now and again we may indulge ourselves. Consumer or not, learning more about the history of such an iconic drink is too intriguing an opportunity to pass up. Here’s a picture blog of our visit. Photographing in here was a low light challenge, so the high ISO and high aperture settings may be noticeable. Enjoy the taste – sorry, I mean pictures! 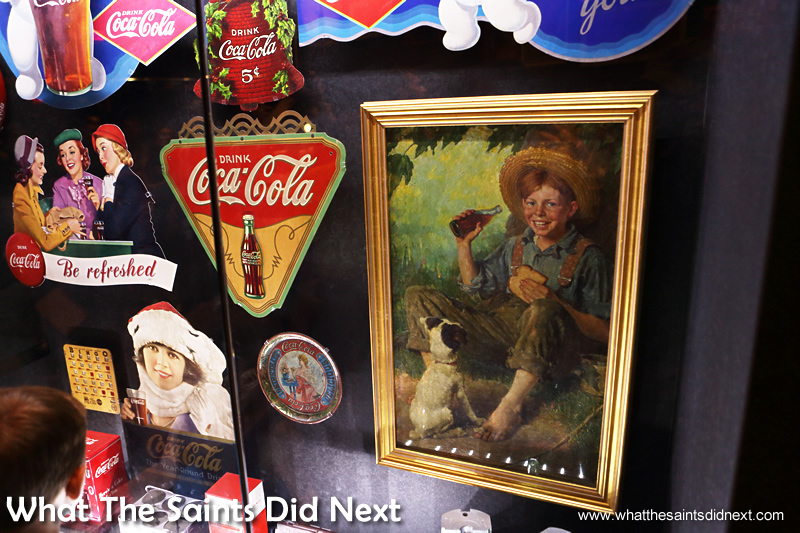 The famous oil painting of ‘The Barefoot Boy’ used to promote Coca-Cola. This is one of six Rockwell paintings commissioned between 1928 and 1935. 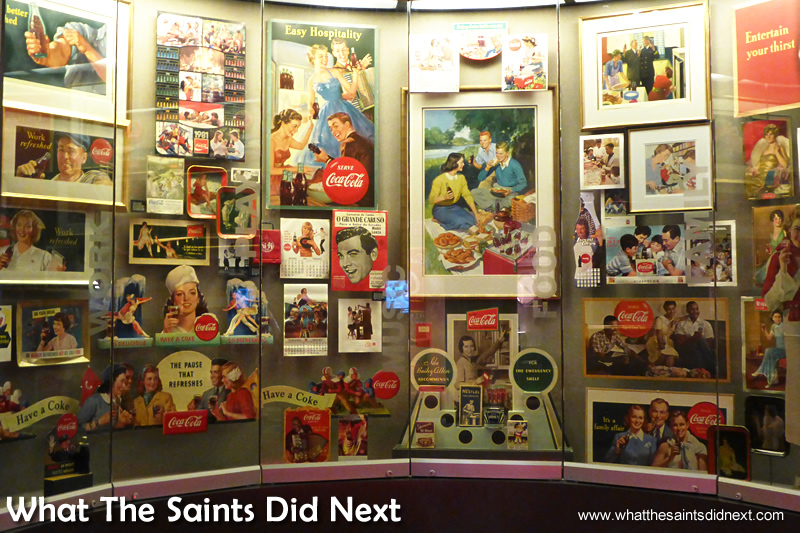 This copy is on display in the World of Coca-Cola museum Atlanta. The invention of Coca-Cola came about after John Pemberton was wounded in the American Civil War in 1865 and became addicted to the pain killer morphine. As a pharmacist he set out to find a cure for this addiction, and eventually after various twists and turns, the carbonated soft drink Coca-Cola went on sale for the first time in 1886. 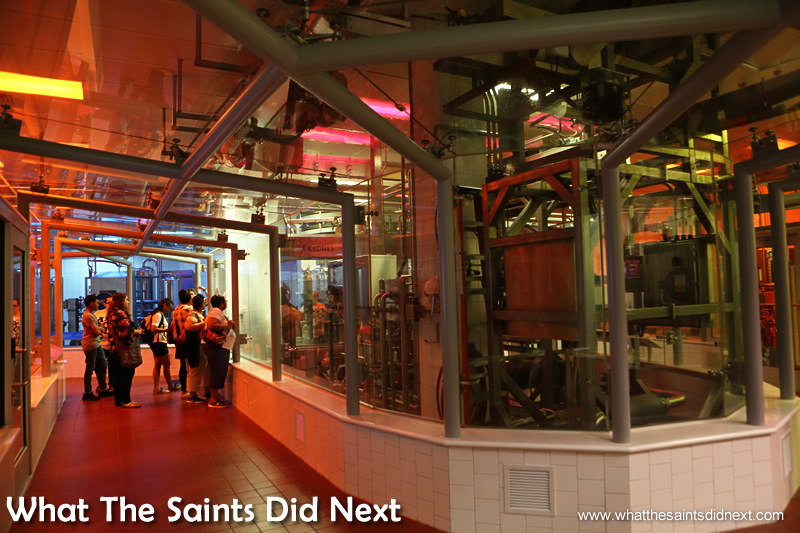 Much of the tour is themed around teasing visitors about discovering the secret recipe of Coca-Cola. Do these safety deposit boxes inside the museum vault hold the ingredients? Hmmm. 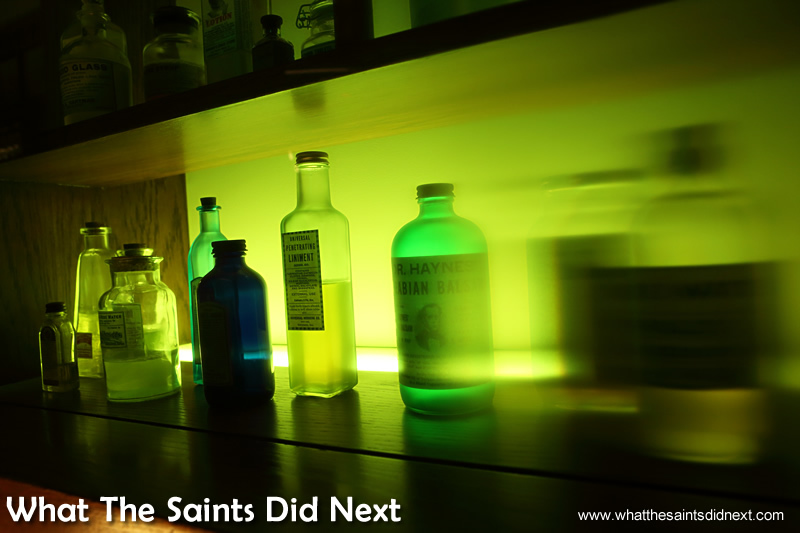 A room full of colourful potions and bottled flavourings that may or may not be part of the Coca-Cola recipe. 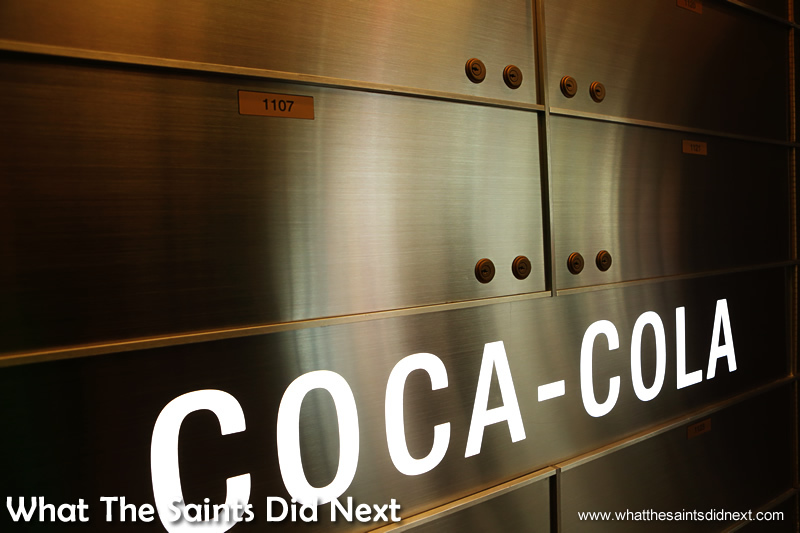 All part of the mystery of the ‘secret of Coca-Cola’ tour. 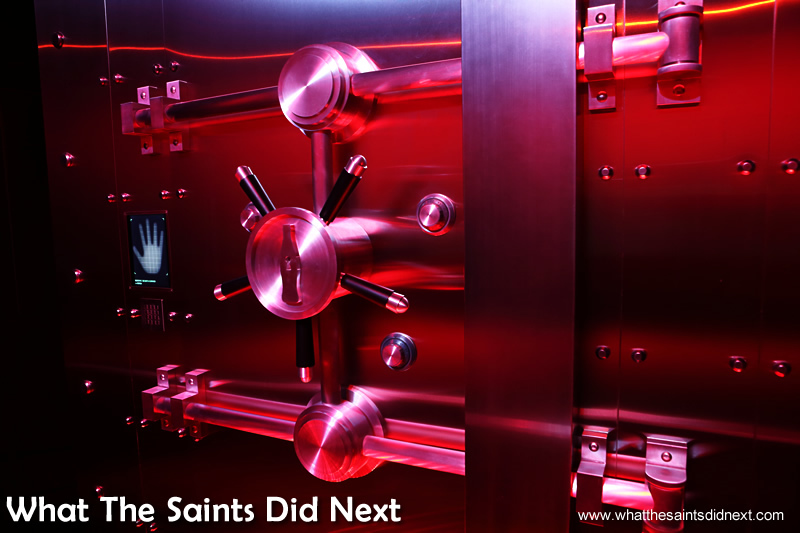 Great fuss is made about letting us see the heavily reinforced door inside the heart of the ‘Vault.’ Surprisingly the door stayed locked and the soft drink formula kept safely out of sight and reach. 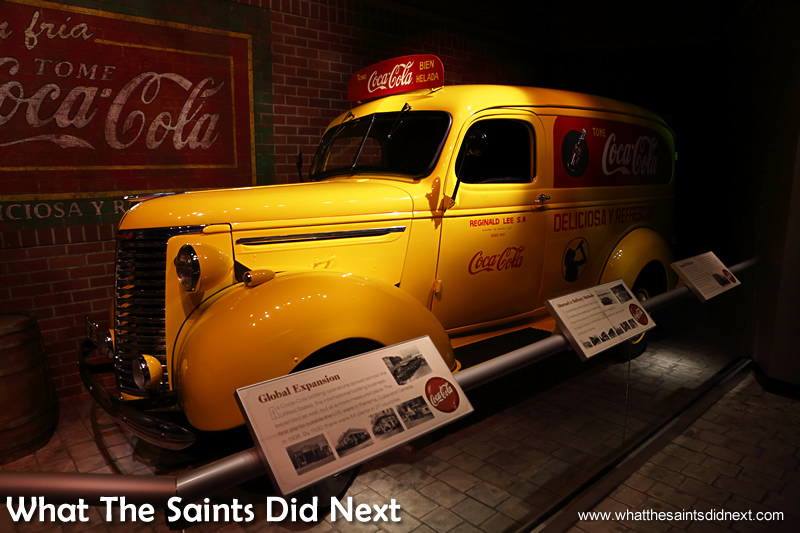 Memorabilia that encapsulates the cultural lifespan of Coca-Cola is on display in the World of Coca-Cola Museum Atlanta, including this bright yellow car. We think this is a Chevrolet but not sure if of the model. Any car enthusiasts with suggestions? Advertising paintings for Coca-Cola from years gone by. 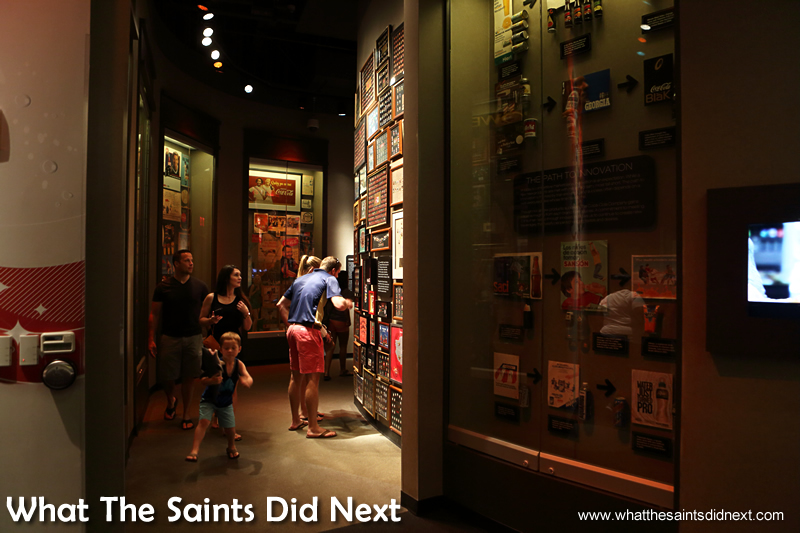 World of Coca-Cola Museum Atlanta. 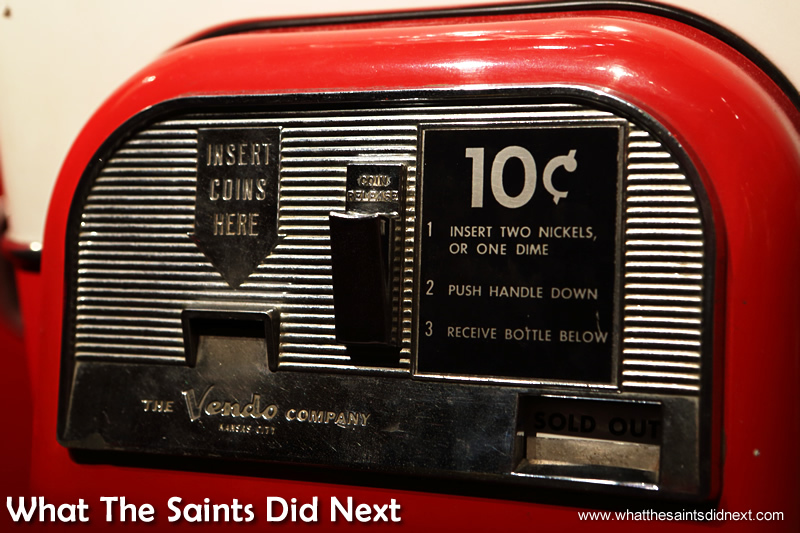 Imagine paying 10 cents for a Coke today! Visitors touring the World of Coca-Cola museum Atlanta, Georgia. The tour now moves into the bottling section, very interesting. The process is taking place behind the glass windows which we can observe while moving through the corridors. 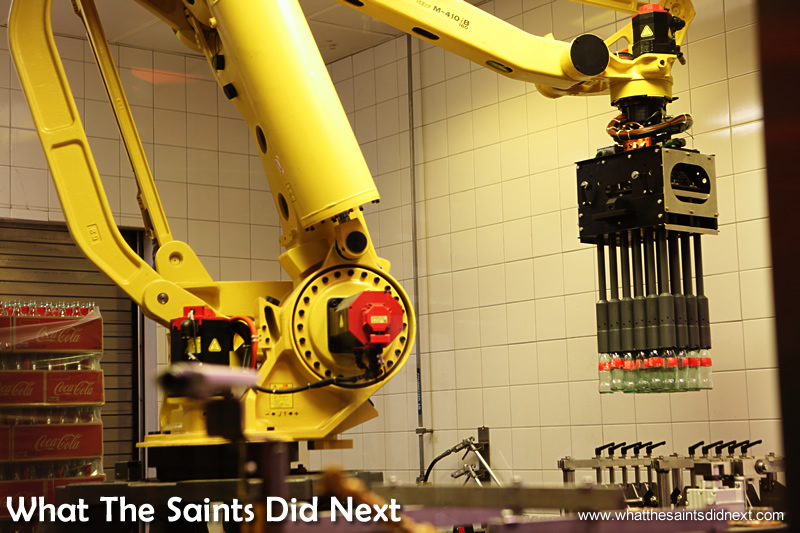 This giant machine was reaching around the room to pick up stacks of bottles and deposit them onto the production line with stunning and speedy precision. Very mesmerising to watch. The final part of the tour was the ‘all you can drink’ tasting room, ‘Taste It.’ Dispensing stations around the room were set up with different samples based on the regions of the world they are produced/sold. Sharon’s checking taste testing ‘Sparberry’ from the African range. 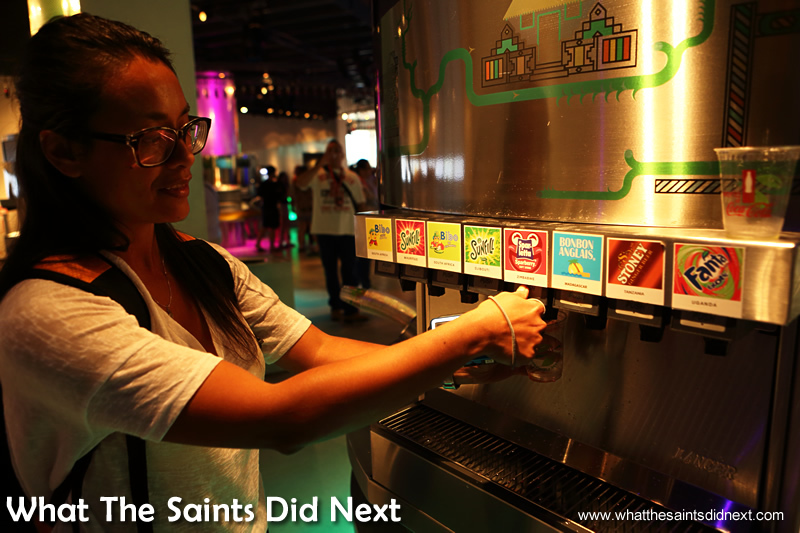 Visitors are free to try all or any combination of 60 different Coke flavours that are sold on five continents. The Europe dispenser is visible foreground, right side. The Asia selections are off to the left in this picture. 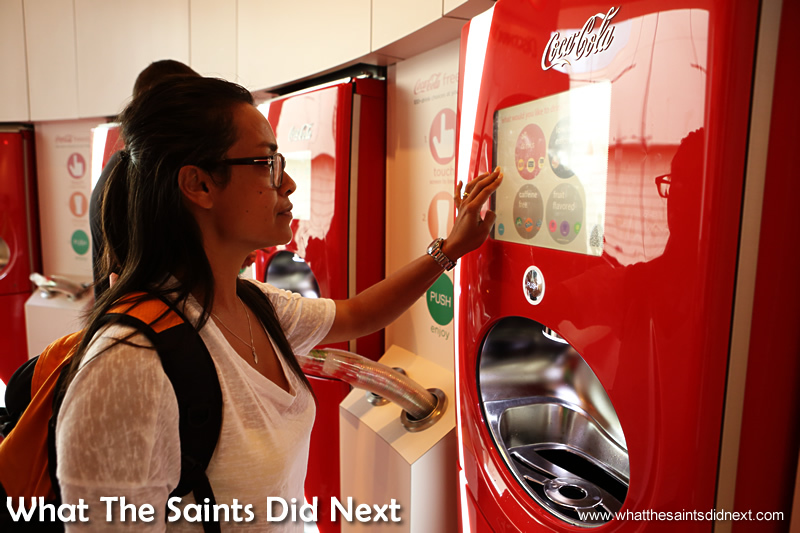 Another feature in the Taste It part of the tour is the ability to mix and design your own Coke flavour. This interactive option seems to be missed by a lot of people already full from overdoing the free tasting earlier on. All Coked up after coming through the Taste It room. 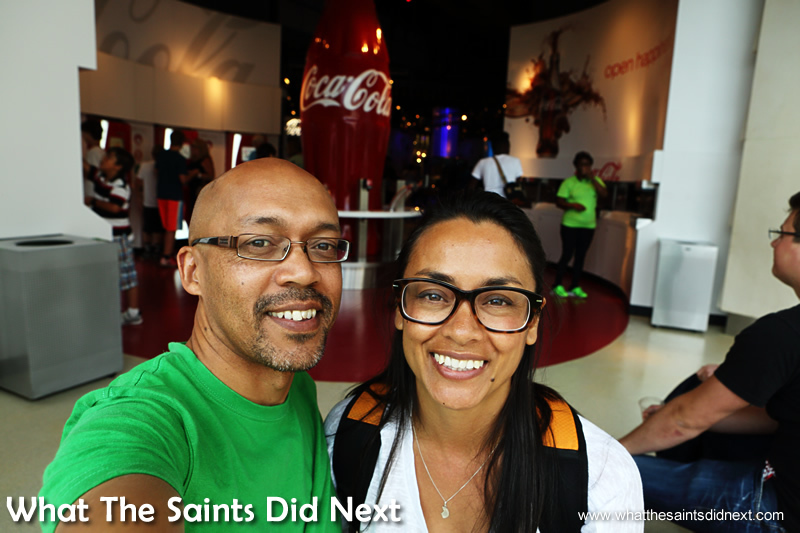 World of Coca-Cola Museum Atlanta. One of the really cool finishing touches to the tour – we all get to take one bottle each for free, right off the conveyor belt and take it home. 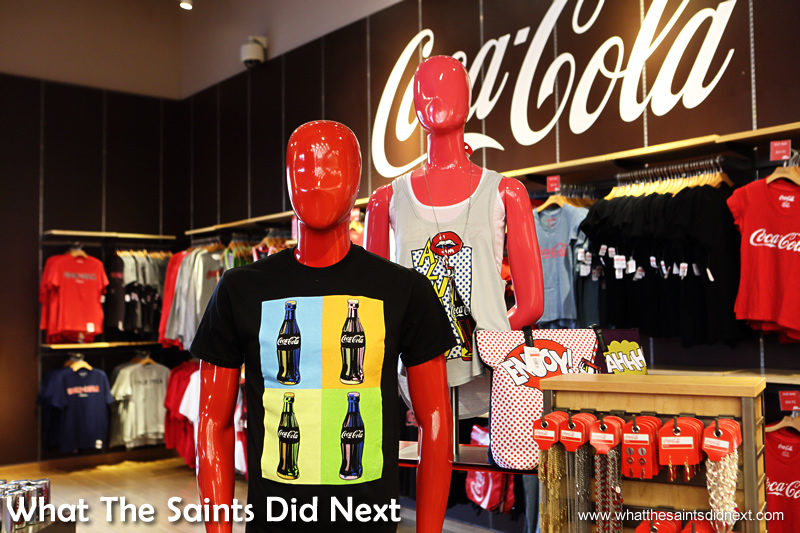 As with most tours these days, the exit from World of Coca-Cola Museum Atlanta is via the gift shop! 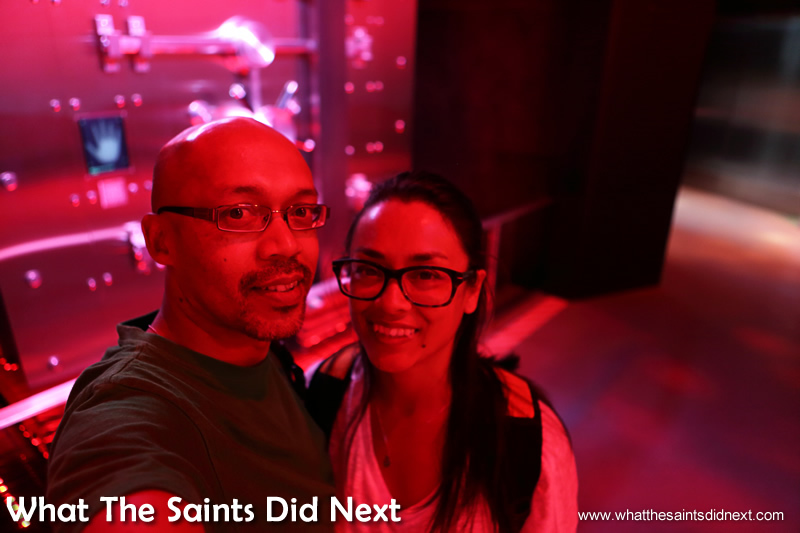 Here we are taking a selfie outside the vault that holds the ‘secret’ to Coca-Cola. We actually had to wait until the very last minute when the viewing room had emptied so we could get some space.